"We are the great work of art in progress: WE, ourselves." Rafael Montanez Ortiz has been a controversial artist since the early 1960's. His sculptural and video works, and documentations of his performances, are included in many collections, including the Museum of Modern Art, the Whitney, and the Musee d'Art Moderni in Brussels. He was the founder of the Museo del Barrio in New York, an important forum for Hispanic culture and art. He is also a writer and an educator, and has been a Professor of art at Rutgers University. In the early '60's, Ortiz gained recognition for his Deconstructed works. When he destroyed a sofa in 1963 for the "Archeological Finds" series, the Art World became excited about "restructuring the ready-made". But what was significant to the artist was the act of alchemical de-construction itself. The sculptures were artifacts, residue, archeological finds left behind by the release of emotional force. Ortiz came to believe that destructive energies could, and should, be released within the "appropriate arena" of art, and of the dream - addressed as both aesthetic and psychic processes of inner transformation. His Deconstructed Objects evolved into performances, collectively titled "Destruction Realization Rituals". In 1966, Ortiz attended the DESTRUCTION IN ART SYMPOSIUM (DIAS) in London. His first Piano Concert was at the request of the BBC. In "concert" with Anna Lockwood, a classical pianist, and film maker Harvey Matusow, they systematically "deconstructed" a piano. 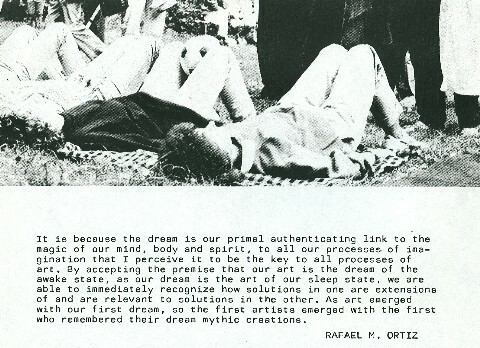 "Destruction has no place in society", Rafael Ortiz wrote years later, "It belongs to our dreams - it belongs to art." When I read this, I thought of the Iroquois, who held a five-day midwinter festival called the "Feast of Dreams". Here members of the tribe brought their significant dreams to the Circle, to be shared and interpreted. If a dream expressed a "soul wish", the tribe endeavored to help the dreamer to work it through, by symbolically dramatizing it for them. In the 1960's, Ortiz became interested in the human potential movement, and studied Tantra, Sufism, and Bio-energetics. In 1978 he took a leave of absence from Rutgers University, where he was teaching, to attend the Rocky Mountain Healing Arts Institute in Colorado. There he studied body-centered healing techniques, including re-birthing. He found that his studies of healing technology corresponded to a long interest in tribal shamanism and native spiritual traditions, wherein fasting, duration running, sleeplessness and physical ordeals were often used to seek vision, to enter what Ortiz calls the Dream. "And what is the Dream?" I asked. "The Dream" he responded, "is the original Art Process." After returning from Colorado, Ortiz developed Physio-Psycho-Alchemy, his Inner Visioning performances. Each Performance begins with the participant lying on the floor, squeezing a large plastic ball between one's calves. The participant/performer is instructed by Ortiz to concentrate on breathing deeply, and applying continual muscular pressure on the ball. The body begins to arch involuntarily - it is as if one is pulled up from the center of the chest. This spontaneous flexing is a release of energy - what he calls physical and emotional "armoring". By maintaining pressure on the ball, a muscular tension develops which, in combination with concentration upon the breath, creates an altered state of consciousness. It is at this point that Ortiz invites the participant-artist-creator to begin the "Inner Visioning" process, to pay attention to the images and sensations, memories and emotions that arise. Participation in Physio-Psycho-Alchemy is an ongoing "work in progress". Some performers, in a kind of lucid dream, relive primal memories from childhood, or what they view as memories from past lives. Others, as visionary travelers, contact an inner landscape, a country where they encounter beings that converse with them,mythic images, and archetypal forms that illuminate and surprise. This is not something one has an interesting intellectual encounter with, like viewing an exhibit at a museum. Something to "get" and aesthetically move on. It is experienced on levels beyond intellect, and the artist/dreamer/performer is both Director and Actor, shaping his or her own performance. In the late '80's Rafael Ortiz also created a series of sculptures he called Waxworks. He collected objects from acquaintances, which he then imbedded in wax, along with the stories about those objects which are written on clear acetate. The objects imbedded in the semi-transparent wax derive from events that had profound affect upon the lives of those they belonged to. The wax, thus, holds their actual experience, as well as their stories. "Wax is, for me, a transformative medium. We talk about the moon waxing and waning, we talk about a wax museum...in other words, time and the history of time is held in this medium. It's transparent, but not as ephemeral as ice, which can turn to water and evaporate. Wax is a medium that is fluid, that can solidify and melt in the heat of life.............The idea of putting objects into wax embodies the waxing and waning of time, and the embedded object is the Icon of experience. These are rituals that change us in some way, and my concern, again, is that art become a transformative process that is life-affirming, that moves one into an enhanced self-understanding. The existential exchange between you and the object is the Context. So, here I have objects in the wax, and a story that goes with them, the Text, that also has gone into the wax, and also becomes part of the Object. And so there is a Text within the Object, and there is an Object within the Text. That's the transmutation, the invisible reality made visible." In his early work, Rafael Ortiz as performer released unclaimed destructiveness,within in the arena of art. In his later work, Physio-Psycho-Alchemy he invited his audience to participate, as visionaries, in a conscious dream, becoming multi-dimensional artists. "Waxworks" was existential Alchemy, sculptures moving through time. Lauren: You have spent years studying native cultures and shamanism. Do you believe there is a relationship between what we call schizophrenia and shamanism? Joseph Campbell, among others, thought so. Rafael: Psychologists often view early religions, shamanism, as related to insanity, and that's incorrect. It is a logic process that is "paleological", meaning it is a predicative and sub-predicative association, allowing one to find the relationship between things which ordinarily you wouldn't find. Within the very powerful context of metaphor. You run fast, a deer runs fast, you're a deer. This is an issue of belief. That belief exists, in and out of trance. The trance is only the vehicle for further revelation. Lauren: The shaman/visionary is not cast into what we might call the unconscious, but chooses to go there? Rafael: He or she places themselves there for vision, but he or she is already there. In other words, Paleologic is operative as a culture process. Very much like the Senoi, who work with the dream and all of its contradictions on a daily basis, which psychoanalysis would call very neurotic, psychologically distorted, pathological. And that is ridiculous! A culture that shares its dream daily moves Paleologic into a culture process, information that is exchanged between members of the community, and is valid and rational. It's not "we're all being crazy now". That's how we see it. Paleologic is a holistic kind of reasoning, the sense of oneself being part of the universe, and everything being a part of everything else. It's their sanity. When we feel that, and are then overwhelmed because of our own contradictions, submerged anger, and so on....then all these associations overwhelm us and we are "insane". Rafael: Absolutely. These early cultures manage what our later "civilized” cultures cannot, which is being comfortable with a sense of one's place in the universe. Lauren: What exactly do you mean by "Paleologic"? Rafael: You can break logic down into Platonic logic, which is ideal, Aristotelian logic, which is more practical, the logic of subject, and then Paleologic, the logic of predicate and sub-predicate association. Once you become ideal, you find things are not related, but are separated, ideally separated. At the Aristotelian level, the world is seen in an even more complicated way, everything breaks down. In Paleologic there is the concept of holistically defined relationships between everything on all levels. The culture that is holistic is holistic because its reasoning structure is holistic. The problem we have with holism is that our reasoning is fragmentary, it removes us from relating things, it structures things in separate compartments in order for us to "have control". Lauren: And thus blinding us to the essential connections? Rafael: Paleologic asserts that Spirit resides in all things. And thus we have a responsibility to all things because we're intertwined with them, and they to us. Paleologic cultures least objectify, we most objectify. Lauren: In the book about your work, published by El Muse Del Barrio, there is a quote by you that struck me: "Destruction has no place in society - it belongs to our dreams, it belongs to art." How can destruction take place in our dreams and art, and not in our lives? Rafael: Destruction, viewed from our cultural perspective, is the result of a sense of injustice, deprivations, a sense of disenfranchisement, whether coming from the real experience of being disenfranchised, or simply having a tantrum at not getting what you want, that is accumulated. Not everybody wants to become a boxer or a hockey player, which are outlets for that aggression to be released within an acceptable game structure. Generally, there is no arena within which these forces can be released. Art, being available to everyone, is the perfect arena within which these rituals can occur to bridge gaps between one's conflicts, and one's having to be in the world in some humane way. Lauren: How did you move from the De-construction Work you did in your youth, to the work you are now doing? Rafael: For me, before one can appreciate a higher purpose, one has to integrate and resolve one's lower purposes. Lauren: Which is what the De-construction work was about, ritualizing the tantrum or that collective force that is the root of destructive behavior? Rafael: Yes, but it becomes re-integrated, evolving to where you are finally sacrificing subtle things, like your ego, your loyalty to an environment or world view that keeps you from a holistic consciousness. Sacrificing objectification. Not to be entranced forever, to be "blissed out" in some self-indulgent ecstatic state, but to be appropriately connected with the life force in everything. That's where my work Physio-Psycho-Alchemy begins: the work is then on a level wherein higher purposes can be addressed and accomplished. It's like a trip into Hell, moving in a spiral up to Heaven. But through the experience of your Hell, so you can be integrated and released. Thus, it doesn't become a service for holy wars. There are many who want to move into their higher purpose, but deny, haven't resolved their lower purposes, their shadows. They assume they can simply discard it. These are the people who start a jihad. Lauren: If we deny the shadow, we'll somehow project it outside of ourselves? Rafael: Remember the movie, "Forbidden Planet"? Lauren: Yes, their "id creature" destroyed their civilization. So, in order to integrate these internal forces, one must see it and be it? Rafael: Or find a safe haven for it, and art is a haven, a solution. Lauren: When did you first begin to explore some of these issues? Rafael: Years ago, when I was an undergraduate, I had a concern for the visionary, asking how I could move that into art process. I read the DOORS OF PERCEPTION, I read about the Native American peyote ritual, and a number of other related books. That was when I began to seriously think about and explore what information was available about shamanic cultures. To see how I could reconnect from those cultures into my own contemporary art. As it relates to my Inner Vision work, certainly then I recognized the importance of the vision quest. I saw it as an important part of the art process. I began to study the Sufis, Yoga, all those techniques in which one's own physiological potential can produce altered and heightened states of consciousness. That became, for me, part of my higher purpose; the idea of our having these abilities intrinsically within our own bodies - within the power of the breath, the nervous system, and the imagination. Physio-Psycho-Alchemy is about releasing a muscular and skeletal hold that consciousness has on the body as it concerns itself with gravity. You can then begin to feel the power of the life force. It's like floating on the surface of a body of water that is in wave action; and as we give ourselves up to it, we gradually become conscious of the life force, we're letting it flow. That's one level. The breath moves us from an acid state. We release carbon dioxide, which is acid, and taking in more oxygen, we move to an alkaline state, which excites the central nervous system. The central nervous system then begins to release information, imagery. So, as the body releases, the central nervous system sends energy and information. It's as if every cell in your body makes a phone call to you at the same time. At that point, you can feel a pull from the heart center, up to the center of the universe, and you go through that dance, feeling it pull you up without any effort. Then you're ready for the Inner Vision work. At that point, the Inner Vision work becomes profound, and is in service of releasing the body to the innate life force, rather than distracting the participant from release, which can happen. That distraction is like being on a journey, and you stop at some curious, fascinating pebble along the way and stay there, instead of continuing on the road. The idea is to continue. Often, I keep suggesting that the participant goes back to the release, the breath, the next level, in order to not become entranced by suddenly becoming aware of something he or she has never been conscious of before. It's important to combine releasing with the breath work, and experience a complete release before going on to the Inner Vision work. At the beginning of the work, you have to pay attention to where you conserve energy, where your "armor" is. At the first level of the work, you're becoming conscious of how you hold your body. With breathing and muscular techniques, we learn how to "let go" of the body, and we don't see it as "losing control". With Physio-Psycho-Alchemy, you re-acquire the assurance that you are in complete control, you can give up the body to the nervous system: and as you give up the body, you begin to be conscious of it. There is an interdependency not unlike quantum mechanics. The more attention you pay to the particle, the less able you are to locate its position. When you consciously "let go" of the body, you consciously "let go" of space and time. Lauren: I have to ask the question you so often receive. How is this art? Rafael: How is this not art is really the question. Art is not something that is "in the eye of the beholder". That's like saying "life is in the eye of the beholder". Art is an inherent part of being itself. We can say that art is the imagination of form, and that within some greater metaphysic, it is the soul's imagination, encapsulating a history of being, that then seeks the flesh of matter to be. It's called incarnation. In terms of art process, if you can understand that, see where it begins, you can certainly then envision the imagining itself, in your day to day life, as being works of art. Dreams, awake and asleep imagining. We are the art material, the great work of art in progress: we, ourselves. Lauren: You have said that there is no separation between the dream and art. What is the dream? Rafael: The dream is where the important formulations, solutions and relegations occur. It's the state within which the mythic potential that is ours unfolds, and teaches us. We've lost touch with that. Native cultures give integrity to that process. Again, when I say native cultures, I mean the original cultures of the world, whether we talk about Sumerian, Celtic, Native American, the Mayan, the Hopi, the African shaman.....those cultures within which the dream was central to their evolutionary development. Our civilization sees the dream as irrational. I remember actually reading once about some scientist trying to invent a pill that would eliminate the toxin secreted by some gland in the brain that would then eliminate dreaming! We want to eliminate it, because we are a culture that is still suffering from nightmares, in contrast to the Senoi in Malaysia, where there is no nightmare, it's all been integrated by the time one gets through adolescence. Then, your dreams serve your highest creative potential. The dream is for counsel, whether it's finding solutions for an illness, or ways to engineer a bridge that has to be built. So, the dream becomes the original art process, the art process that is inherent to our being, our imagining, our creativity. We daydream, we sleep dream. That imagining is the original art within which we make this bridge. Lauren: So our denial of the dream is one of the reasons you once referred to the modern world as "psychotic"? Rafael: Yes. Unfortunately, a psychotic is the last to know his own psychosis. Until, as with us, it can unfold in some unbelievable catastrophe, such as a nuclear war or ecological disaster. I was reading a newsletter recently that espoused the most insane notions of what our economy should be like. It was something that is published and distributed to people who are interested in investing in stocks, buying gold and that whole business. What it advocated, without any self-consciousness whatsoever, was the idea of an economy absolutely free of any control. Wherein there was no concern for the support of any persons in society, or for the planet for that matter. Being your brother's keeper, humanism in such light is seen as witchcraft, subversive, un-American. That to me is psychosis. Lauren: How do you work with a group in your performances? Rafael: It is participatory within this idea that art is "actual". It's important for the audience to not be passive. To avoid an abstract/cognitive notion of involvement. The abstract/cognitive allows one to violate physical realities. We can find all sorts of amazing rationalizations through abstracting that remove us from feeling, from empathy. For me, art that utilizes only cognitive ability is teaching us, at the mythic level, to shift away from the body as a complex sensory experience that can tell us when we've shifted away from higher purpose, from compassion. Lauren: That shifts us away from realizing that the body is also an aspect of our spirit? Rafael: The brain isn't just in our heads. The brain is the entire body, which includes the aura, all of the etheric networks that exist between us and all life. Whether we're talking about a forest, or another person, the abstract/cognitive removes us entirely from that experience of communion, the ability to sense what is going on. These abstractions become what is going on. We can objectify at the drop of a hat. We have no problem making an object of anyone or anything. If the logic of a culture permits you to abstract to that extent, it then permits you to live without conscience. Whereas if you feel interrelated, you have the freedom of genuine conscience. Rafael: Exactly. You feel what you do. This is the paleologic of native cultures. And the artist can reconnect with native cultures in forms, contents, materials, strategies, and metaphysics in a way that includes the present experience. We're talking about a tradition that has grown over thousands and thousands of years. How old is contemporary art? It's a babe in the woods by comparison, in terms of understanding creative process, and how that process serves our relationship to each other, the planet, and the universe. Within the participatory traditions in art, there is no passive audience. That's a recent idea, which is part of the compromise, the tears and breaks from arts original intentions. The ancient art process was a transformative process; it wasn't a show, it wasn't entertainment. Art becomes entertainment within a culture that objectifies. If one can enjoy that transformative experience, and certainly in early cultures it was enjoyed, you could perhaps say it was "entertaining". When you say entertainment now, what is meant is that it doesn't change you in any way, what it does is to help you to forget. We need to see ourselves again as part of a brilliant, shimmering web of life. An artist at some point has to face that issue. Is the art connecting us and others in some way, or is the art disconnecting ourselves and others? I think it's not enough to just realign ourselves personally either - our art should also do that for others, and further, it must happen outside of the abstract. It must be a process that in its form and content joins us with the life force in ourselves, and in others. And that's not going to be easy. But I do believe that secrets and solutions exist in native cultures of the world. They spent thousands of years uncovering those possibilities, and enough has survived through different traditions for artists to find more than enough inspiration.